Sri Lanka’s East Coast is far away but has the best beaches and friendliest locals. We stayed in some paradise-like beach resorts that made a perfect setting for our holiday. We really liked the east coast. No tourists, no crowds, just us and the smiling locals. East coast must be what the old Sri Lanka used to be. Few tourists have found their way to this piece of paradise which makes that you can easily find a beach for yourself and spend lazy days watching ocean waves, just doing nothing. Why haven’t the crowds found the east yet? Since the area has been isolated from the rest of the island – for decades, for hundreds of years . First there was no proper road and then the long civil war that hit the east very hard. And there was the 2004 tsunami that destroyed what was left. So Sri Lanka’s East Coast has suffered a lot and for long time periods. But now Sri Lanka’s east is developing again. New hotels and resorts are built on the sandy coastline and locals that left abroad now return home and invest their money. And the young look positively into the future. Sri Lanka’s East Coast welcomes tourists with excitement. Here you can see the central part of Sri Lanka’s East Coast on the map, with our driving route from Trincomalee to Passekudah. To see the whole coast, zoom out the map. The East Coast faces the Indian Ocean and is backed by jungle on the mountain side. In Sri Lanka you can do something you probably wouldn’t do in Europe: in Sri Lanka you can rent a car with a driver. Think about just relaxing on the back seat without concerns about driving and traffic. And you don’t even have to pay a fortune for the luxury! So the local travel agent Connaissance de Ceylan planned our trip and arranged our car and driver. And there are more ways to travel… These people are on the way east as well. Not a bad way either but we wanted more comfort. And then after all driving: the coast and Trincomalee! And the Indian Ocean! Indian Ocean and Trincomalee beach! Trincomalee is the capital of the east and the island’s third biggest city. It’s much more a local than a tourist city. Fishermen set sail from the sandy beach right in the city. The beach is called Dutch Bay and it’s both a beach and a fishing harbor. Brightly painted fishing boats line the Dutch Bay and if you see someone swim they are most probably locals. It’s hard to believe the Trincomalee you can see now has been big and famous, not only in Sri Lanka but globally. – There is another, bigger harbor on the lagoon side and that used to be the whole island’s main port. That was in the Anuradhapura and Polonnaruwa eras. And not only that, Trincomalee also was the main port in Sri Lanka for the Portuguese, Dutch, French and British – until the Galle and Colombo ports were built. So Trincomalee was totally forgotten and now we only have these fishermen. Yet the European invaders left their fort that still exists and stands there after the centuries, civil war and tsunami. But the fishermen, how do they prepare the fish they catch? They salt, hang and sell it. This is how they do in Sri Lanka, they dry and eat fish. Just like our Lapland people hang and dry reindeer meat. Sri Lanka’s East Coast is quite different from the west. And its people are different. The east is a mix of Tamil, Sinhalese and Muslim people so there’s a wide range of religions as well. Most tourists don’t stay in Trincomalee though, they head up the coast to the small villages of Uppuveli and Nilaveli. Both have long sandy beaches and some accommodation, ranging from budget to luxury. Nilaveli beach is the wider and longer of these two. Nilaveli hotels are located in a coconut forest and they are not directly by the main road while in Uppuveli everything is closer to the highway. Both villages are still authentic and quite undeveloped but there are the basic services. Nilaveli has a few beach hotels along the sandy coastline, a bit hard to find in the coconut forest, but there they are, facing the sea. We came to Sri Lanka’s East Coast for the fine beaches. And we wanted to test what beach resort life is like – and here in the coconut forest was our first resort, the Pigeon Island Beach Resort. A beach resort couldn’t be better located. 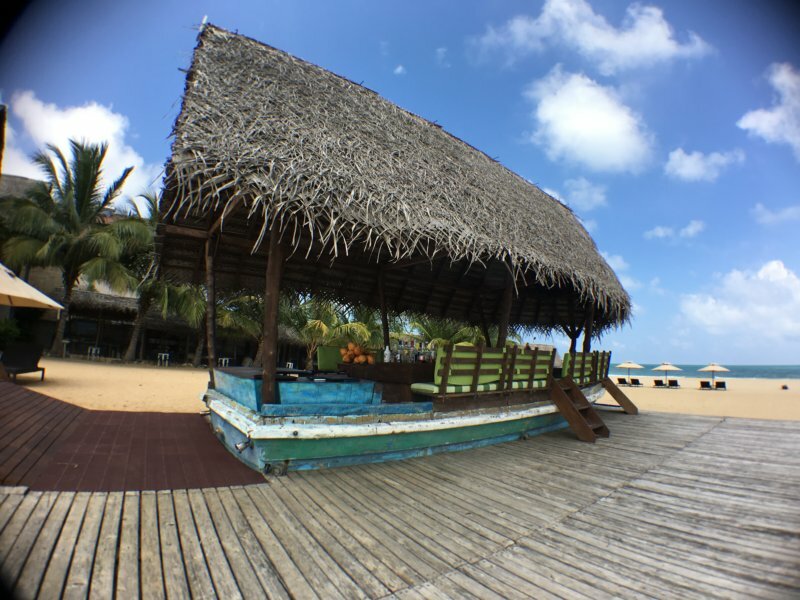 Pigeon Island Resort is right on one of Sri Lanka’s best and widest beaches, the 4 km long Nilaveli Beach, backed by a lush jungle. There is some distance to the main road so you don’t hear the traffic. We really needed this kind of resort after the exhausting drive. We wanted to relax and take in the Indian Ocean atmosphere. This place met our needs, it was very relaxing, quiet and nice – just us, the sun, the waves and the jungle birds. And the pool: we had it to ourselves. There were not many other guests at daytime and most of them were on the beach. But at dusk it changed as tour groups arrived. Bus loads of tourists touring the island came and stayed the night and they all left in the early morning. So dinner time was very busy and the daytime was peaceful. 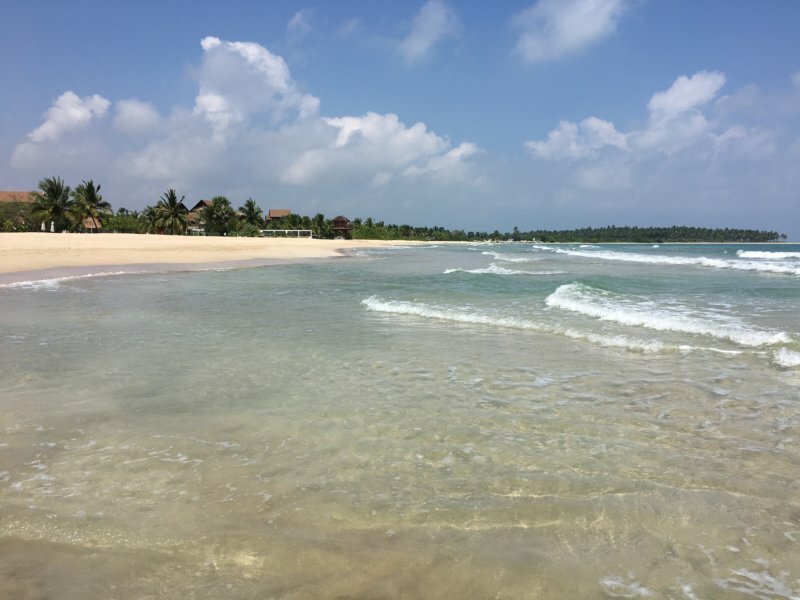 One of our Sri Lanka dreams was to stop, sit and enjoy the sun and the ocean – and now this dream came true. Driving 1600 km in two weeks and seeing most of a country is a top thing to do but in between you need a break. Clas was wave-gazing and wondering how they made these coconut parasols and how long they will last. I was more in the tropical ocean waters and looking at the palms and the jungle from that perspective. Nilaveli Beach is a perfect beach, and this section of it was – just for us! The National Park of Pigeon Island is just offshore and we could take a boat tri and see the famous corals. No – we want to stay in this place! Trincomalee is some 15 km south but we saw it already. What more should I think about before falling asleep: the dinner will be in three hours and there will be live Sri Lankan music. Our room was very good. First of all there was a huge balcony with jungle views and we had private stairs down to the where the pool was. And the room: it was huge too and the bathroom was big enough for both of us at the same time :). But we also tried a newly built resort in the same area. That was Trinco Blu in Uppuveli. We left south and stopped at Uppuveli. Just briefly, having lunch at Trinco Blu. They specialize in a tasting buffet lunch and our driver said we should try the Trinco Blu lunch. That really was a good one, we sat in the main restaurant that was open to the sea. You can see the restaurant and my picks from their dessert table below. The other photos show the Trinco Blu pool that we didn’t try. But the pool looks inviting and the beach is just behind. Such a peace here too, and such a harmony. This was just a brief stop but what we saw we liked. Trinco Blue, too, looks like a good choice for a Sri Lanka east coast beach vacation. Sri Lanka’s East Coast is a land of rural coastline with occasional fishing villages. Painted boats and fishing nets, all in colors. East coast’s Tamil people like strong colors and so do the fish, they like the colored nets. It takes many men to take in the night’s catch. And here again, they dry the fish in the tropical sunlight and sell their catch on the roadside. This is what the villages are basically like. Since much of the coastline and all roads were destroyed in the 2004 tsunami there is lots of rebuilding going on. The roads are in a bad condition and need more repairing. Other main sources of income are farming and cattle raising. That means roadside rice fields and cows and bufffaloes on the road. This man is bathing in the river, with his cows. Cows of course have to be washed at times. The drive from Trincomalee to Passekudah is not long but knowing the road conditions and the amount we stopped it’s a miracle it only took half a day. We had heard Passekudah Bay is an amazing place, yet it surprised us. This place is like a paradise! 2 km of soft sand and shallow waters, and again no people, no crowds, nobody at all on these fine beaches. Can’t wait getting into the water. Passekudah Bay used to be sheltered by offshore coral reefs but a lot of corals have disappeared, partly torn down by the tsunami and partly by people. It is a huge disaster but they are now planting the corals again. It needs a lot of work and one day the reef will be back where it was. The tsunami destroyed everything here including buildings and rebuilding started in 2011. New hotels now appear on the shoreline. The first of them was Maalu Maalu which means fish fish. We were staying in the fish hotel and that’s why I put my fish dress on. Today there are a dozen resorts in all, all with beach access. Maalu Maalu Resort looks like a Sri Lankan fishing village. Hotel buildings with their coconut leaf roofs and wooden walls look older than they are, yet they were built in 2011. I really like this style and everything in the place and it makes me think about an Indian Ocean island and that’s exactly where we are. This is the kind of place many people dream of but don’t know where to find it. A fishing village on poles, built on the sand. Coconut groves around and a stone’s throw to the Indian Ocean. And did I mention the pool? The pool has the same tropical water temperature as the ocean and you don’t feel cold entering the water. Too hard to decide where to go first, beach of pool? Pool or beach, which one to choose? Most guests are staying around the pool. So we took sunbeds and found a shelter. If you get thirsty there is a bar with fresh coconuts on the table – a bar made of an old wooden boat. We normally don’t spend our days in a resort without going anywhere but Sri Lanka’s east coast is different. Every single detail in Maalu Maalu needs that we look at it so we have to stay and not leave…. and we only left the resort to walk up and down the 2 km beach. Our room was in a chalet built on poles and we were staying upstairs. Garden view, pool view and sea view, our balcony had it all. And sofas. The exterior looked traditional a bit worn out but at the inside it was all modern. The room had all you need for a relaxing stay: good air conditioning, no mosquitoes inside nor outside, lots of space for luggage and changing clothes, a big bathroom and a sunny shower area. The restaurant had an exceptionally good service and great meals, we mostly had two or three waiters around us and they genuinely seemed to like serving us. This is a part of my breakfast: fruits, pastries and a hopper with egg and pepper. The chef fries it at request in a deep iron pan. So good! Village fishermen leave to the sea at sunset and return when the sun rises. They push their boats into the sea, set light in their lamps, throw their nets in the deep waters and start their night shift. In the morning they return with their catch, fresh fish, lobsters and giant crayfish. And we enjoy them. Hard work which I can appreciate after they explained it to us. The friendly locals work at night and we instead dine crayfish on the soft sands. You hardly see the crayfish nor the curries you add to it but I can tell you it tastes so good. The crayfish here is at least hundred times the size of the ones we catch in our lake back home. And they add at least hundred times more spices. In Sri Lanka it’s an art how they use spices. Back home, and can’t help dreaming back to the tropics and to Sri Lanka’s east coast. Sri Lanka’s East Coast was a part of our Sri Lanka two week itinerary which you can see on the map. After Passekudah Bay we turned inland and back to the Cultural Triangle. Happy and relaxed after a few resort days and ready for new sights. More on our Sri Lanka Round Trip on the trip main page.